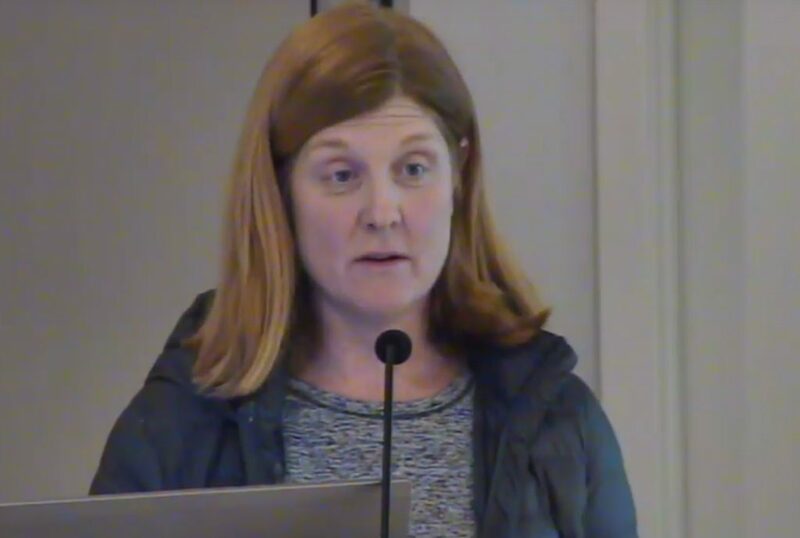 Parent Susan Lanzerotto speaks to the Norwalk Board of Education, Tuesday in City Hall, as shown in the Norwalk Public Schools video. NORWALK, Conn. – Concerns about teenagers vaping has led to a shortage of bathrooms at Norwalk High School. “I feel a little silly coming here and talking about this topic but it has been lingering on and I think it needs to be addressed,” parent Susan Lanzerotto said to the Board of Education on Tuesday. For at least two months the school’s 1,770 students have only had two bathrooms open per gender for most of the day, with a third one open at lunch, Lanzerotto said. “Vaping is the act of inhaling and exhaling the aerosol, often referred to as vapor, which is produced by an e-cigarette or similar device. The term is used because e-cigarettes do not produce tobacco smoke, but rather an aerosol, often mistaken for water vapor, that actually consists of fine particles,” the Center on Addiction writes. “While I understand the challenge, I don’t think the answer can be to close the restrooms and really make all of the students use two bathrooms,” Lanzerotto said. The bathrooms are dirty, there are long lines, and students who don’t get back to the classroom on time are marked as being tardy, she said. NHS Assistant Principal Edward Singleton had told her there was a meeting Tuesday and that he hoped to have more bathrooms open soon, but she wanted the Board to see that it happens this week. Board of Education Chairman Mike Barbis expressed sympathy, said the Board has been trying to resolve the issue, and accused the school’s principal of “not doing his job”. “We definitely take your concern very seriously,” BoE Policy Committee Chairwoman Heidi Keyes said. At that point, Board member Barbara Meyer-Mitchell’s jaw dropped. April Guilbault has been SGC Co-Chair. Duff, State Senate Majority Leader, is one of 17 SGC members. Meyer-Mitchell said after the meeting that Jim Napoli is Co-Chair now. Barbis has been a frequent critic of Duff, and has repeatedly said that Duff does not obtain enough state funding for Norwalk schools. Keyes said that she, Costanzo and the Policy Committee are on top of the issue. Meyer-Mitchell was given a chance to speak. “I spoke to the SGC Chair and this has been raised at the last two SGC meetings at Norwalk High. So that’s not quite factual,” she said. I’m confused, is Mr. Barbis stating that the SGC is responsible for fixing the issue with vaping or is he stating that the SGC is responsible for finding an alternative? Because both options are crazy to me. Shame on the BOE, Dr. A, and Mr. Costanzo for not IMMEDIATELY opening the restrooms. This disgusting and has gone on far too long. Have parents go through background checks, give them passes and let parent volunteers monitor the restrooms. There, I fixed the problem and the cost to the town is $0. Chairman Barbis is correct. This topic of closing the bathrooms and a solution was first now being addressed by the SGC. It has to do with repairing a simple Courtyard that has taken over 3 years to do. You can’t make this up. If this is actually true… Holy wow…. A simple issue boils up to the BOE, our Senator and consumes valuable time. A full breakdown of any coherent system whereby an administrator or other staff member simply calls BS on the delay and opens the doors. Again, in the private sector if such a fundamental issue goes unaddressed at the employee level, falls down at the managers level…stumbles past the VP level…gathers dust in the C-Suite and ends up in the lap of the Board of Directors, someone would be out of a job long ago. Better yet, go rogue and expose this failure by placing a port-a-potty at the main entry to the school with a sign directing students and taxpayers to the ideal solution. Have a News12 reporter or Hearse Media reporter be the first ones to use it. Please let me know where I can donate – I’m in for 20 bucks. Does the Health Department have any responsibility to inspect the bathrooms? In New York, the lack of sufficient bathrooms in a school is a constitutional issue under their state constitution. This may also be actionable under the equal protection clause of the constitution. It’s a particular burden on female students of this age to have insufficient access to a bathroom, due to unique biological needs. I assume the staff and teachers have access to bathrooms at more reasonable ratio than 400:1. They are protected under OSHA. vaping… well maybe but it is my understanding a gang situation is also a grim concern. I wish the local police and NHS Staff would be transparent about it. This way we can quietly work at combating with tips for parents and kids to help keep us safe and possibly expose who and when a crime might be in motion. I believe it’s time for NHS to get a complete makeover. Items such as bathroom, showers, and other update modifications should be discussed. As if we don’t have enough problems already, let’s legalize dope too. One more thing for the kids to smoke. Governor Lamont wants to do it. Please let him know if you have concerns. Edwina Borno: NHS had a complete makeover a just few years ago. It’s key feature was a new science wing. There was a small scandal when it opened, because it turned out the BOE forgot — to install restrooms. I suggest that all the bathrooms at City Hall be locked down until this is resolved. And anywhere that Mike Barbis goes as well until he learns to stop blaming others for something he should be contributing to. This is a HEALTH issue. Kathleen, I hate to tell you but it is not the BOE’s responsibility to be overseeing bathroom operations at our schools … that’s the responsibility of the well compensated administrator responsible for operations at the school, the principal, who oversees the school in conjunction with the School Governance Council. And, Kathleen, what exactly am I supposted to be contributing to? This is very upsetting. I mean, Bob Duff picked out the colors to paint the school – so why isn’t he proactive to keep enough bathrooms open? What’s the problem!! Kids are always clamoring to potty down! Does the BOE do policy reviews? Perhaps you can amend the security policy to ensure that it does not permit unconstitutional denial of basic human services like bathroom use for the children. OSHA already protects the adults. While this is unfortunate it is not a BOE issue. This is simply an NHS issue and should be taken up with the administration there. Fairfield County or Third World Country? Disgraceful. Parents should make a call and slap the school with a health violation and get it inspected. These conditions for months now? What kind of Principal allows this neglect and breakdown in management? He needs to be let go if he cannot so much as provide the students with the most basic of human needs. He also has clearly lost control of his school, which sets off red flags. Sounds like the vaping kids are running the school and not the other way around. My mother is a retired city high school principal. When I told her this was going on, she was rendered speechless. Never on her watch would this situation take place. It is concerning that if the Principal is conducting business this way, and this disgrace has been going on for quite some time, that the Principal has not been sat down by the Superintendent and told to get his house in order, or else. While the SGC can sit with the Principal and discuss solutions on how to resolve the problems, the SGC cannot pull rank over a Superintendent and assume the position of disciplining a Principal and telling him to do his job properly. If the Principal chooses not to take the suggestions of the SGC and chooses to do nothing, then SGC’s hands are tied, and a scenario like that would be why nothing has been done in any quick way. Vaping within the school building should be strictly prohibited, with punishable repercussions, period. Whatever happened to rotating certain teachers as hall monitors to keep an eye on this type of thing? Or someone earlier mentioned volunteers if the manpower/budget does not allow. Or, better yet, if the volume of bathrooms is too large to police, keep all the bathrooms open in timed blocks and have a bathroom schedule/only certain timeframes to use them, as blocks are more controllable to monitor efficiently by limited staff assigned to tight blocks. That with the vaping detectors and vaping is not permitted signs. Sheesh! Just get it done already! Do it for the kids! Pay no attention to the “man” behind the curtain… this highlight the need for better supervision of schools. How can students be denied access to functional bathrooms because the actions of the vaping students? Did the Principal, SGC reach out to central office ? What was their response… ??? Call the Health department. This is a code violation!